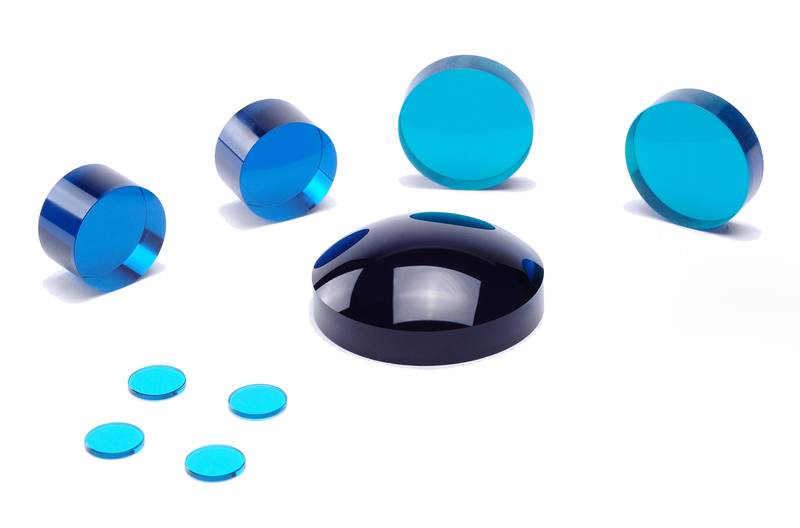 One of the most commonly used UV filter materials, nickel sulfate hexahydrate crystals have been grown at Inrad Optics for more than two decades. Nickel Sulfate (NiSO4*6H2O) is available for custom-fabricated components as well as in a standard UV filter product. Nickel sulfate is susceptible to degradation even in a sealed environment when exposed to temperatures above 60-65°C. For applications with demanding environmental durability requirements, Inrad Optics offers UVC7 as an alternative to nickel sulfate. UVC7 offers similar optical performance with significantly improved thermal stability. Standard Products. Inrad Optics 780 Series UV filters consist of nickel sulfate crystals mounted and sealed between coated filter glass. This combination significantly narrows the nickel sulfate UV passband near 300nm. Custom Crystals Available. Contact us for custom sizes or orientation specifications. All nickel sulfate crystal growth, orientation, fabrication, polishing, and testing is performed at our Northvale, NJ facility, ensuring complete traceability and satisfaction with every single crystal.